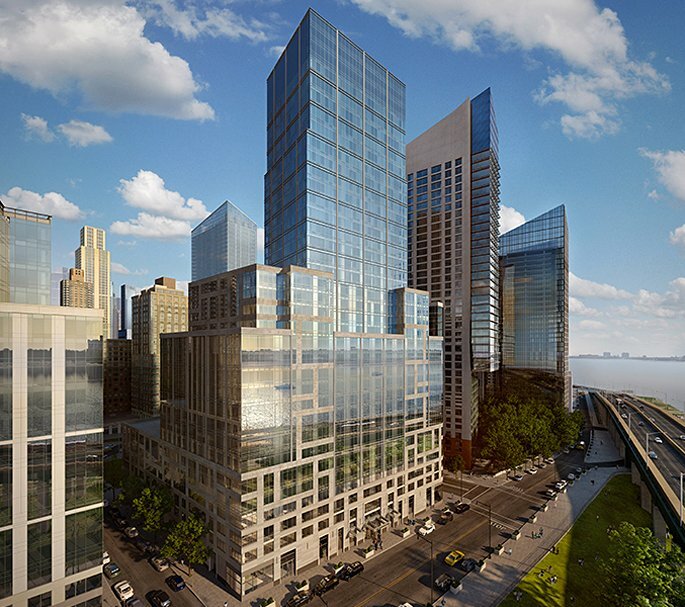 Easily 2014’s most controversial building, Extell’s 40 Riverside Boulevard—a.k.a. the “Poor Door” building, and recently rechristened 50 Riverside Boulevard in light of the scandal—is back in the news, this time for reasons far less unsavory. Starting today, qualified New Yorkers can apply for one of the building’s 55 subsidized rentals. Prices will start at $833 for a studio and go up to $895 for a one-bedroom or $1,082 for a two-bedroom. Applicants with incomes of $30,240 to $50,340, depending on apartment and family size, are eligible to apply, and those in the neighborhood will be given preference to 50 percent of the available lot—this means if you live in Community Board 7, which encompasses Manhattan Valley, the Upper West Side and Lincoln Square, you’ve got a relatively good shot at one of the homes. Affordable renters will have access to a laundry room, bike storage, parking and other community amenities that are separate from the luxury residences. Their luxury counterparts by comparison will have access to shared comforts like a screening room, bowling alley and rock climbing wall. Condos in the luxury building are being priced from $3.6 million to over $20 million for three to six-plus bedroom apartments. You can see all available affordable units and apply here. Applications are due April 20, 2015.